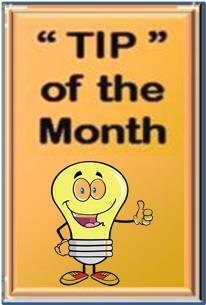 When gas is flowing, a needle valve reduces pressure to 3 to 7 psi needed flow 30 to 40 CFH. The specific pressure required depends on the amount of spatter in the MIG gun nozzle and gas diffuser as well as gun cable restrictions, etc. Flow will remain at the desired preset level even with restriction variations if a principle called "choked flow" is employed. 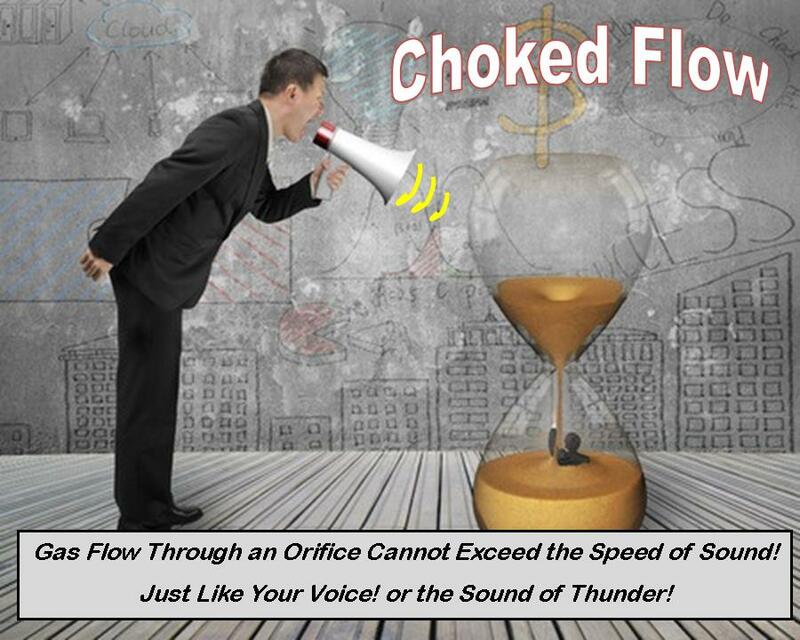 Choked flow relies on the fact that gas velocity through a small opening can not exceed the speed of sound. If the absolute pressure upstream of a needle valve (or an orifice) is twice the downstream pressure, choked flow occurs. With choked flow, the downstream pressure (i.e. restriction variations) does not effect flow rate. Note 5 psi = 20 psia (abso lute pressure) then 2 x 20 psia = 40 psia. 40 psia - 15 psi = 25 psi, the minimum regulator or pipeline pressure needed to achieve choked flow. 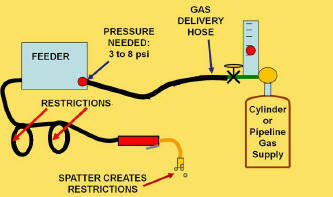 Consider a typical 50 psi pipeline gas supply. 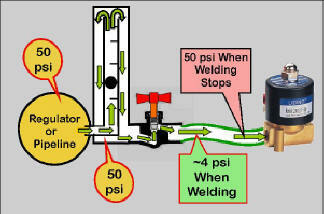 When welding, the needle valve reduces the 50 psi pipeline pressure to the 4 to 5 psi average needed to flow the desired rate of shielding gas. However when welding stops, flow continues through the needle valve and quickly fills the delivery hose with excess gas at 50 psi. The excess gas stored when welding stopped, blasts out of the MIG gun nozzle every time welding starts. It can be 7 times the physical hose volume due to the increased pressure. This causes significant gas waste and also inferior starts due to the moisture laden air pulled into the turbulent gas stream created by the high flow. 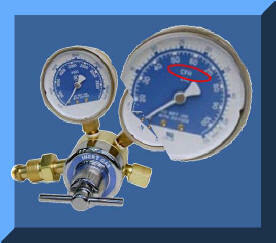 Regulator/Flowgauges (where output pressure gauge is calibrated in CFH) operate by setting pressure above a very small (~0.025 inch diameter) flow control orifice. They use pressures from 30 to 80 psi; above that needed for "choked flow" and "Automatic Flow Compensation." When welding stops, the 3 to 7 psi in the gas hose raises to the upstream pressure of 30 to 80 psi causing similar gas waste to flowmeters. The Conventional 25 psi System maintained the preset desired level of 31 CFH even when the restrictions in the feeder/torch system ranged as low as 3 psi to as high as 8 psi, the typical range found in production. The Low Pressure System was a commercial low pressure regulator device. The gas flow was set at 31 CFH at the nominal 5 psi restriction in the system and then locked in place. However the flow varied from 16 CFH to 37 CFH as restrictions were added and removed from the system. 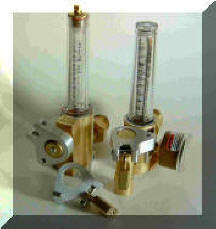 The flow calibrated pressure gauge included with this device read 31 CFH for all the tests! This gives the false impression that the flows remained constant. The flow range would be well out of that defined in any Welding Procedure Specification! No wonder welders set the flow rate, as measure by the gauge, much higher than management believes is necessary! Not understanding the problem frustrates welders and managers! 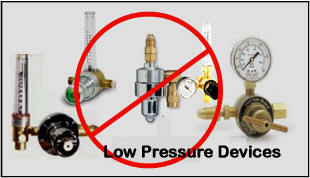 Be careful, some of these low pressure devices do not mention they use low pressure! They may just say "reduce surge," "Gas Guard," or some such wording. 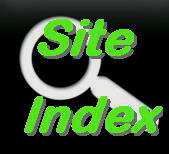 EMAIL IF YOU HAVE A QUESTION ABOUT A SPECIFIC MODEL. Where do restrictions come from in production? 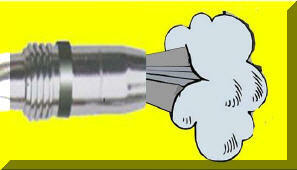 Spatter in the gun nozzle is the easiest to see. 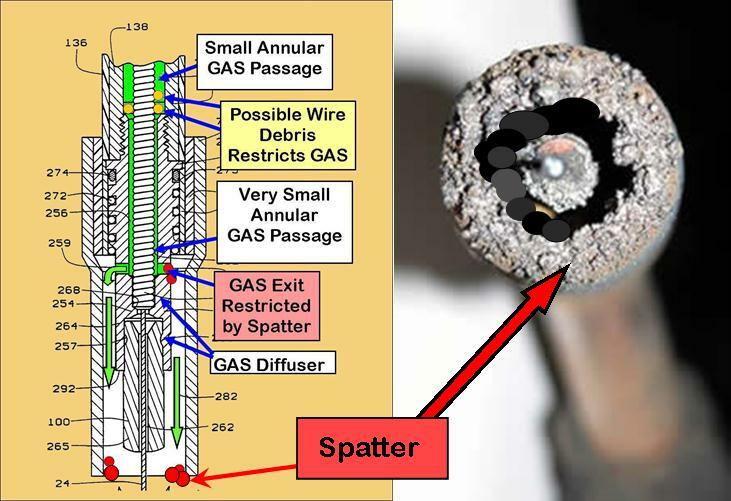 However spatter in the small gas diffuser holes creates even higher levels. Also the gas passage in the gun cable often doubles as spiral wire liner passage and can clog with copper flakes and wire drawing lubricant. Some fabricators expressed reluctance to try our unique patented GSS since they had tried the more expensive low pressure devices which did not work and only frustrated their welders! Our tests showed why they were frustrated! 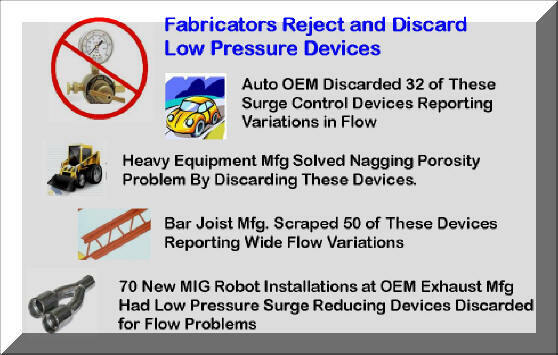 Four, shown in the figure below, reported discarding several hundred of the same low pressure device we tested! Our WA Technology GSS saves shielding gas waste by reducing the volume of gas stored in the gas delivery hose and utilizing a flow restrictor at the wire feeder end of the hose. It does not alter the pressure and therefore the flow compensating feature of the regulator/flow device being used. Hose restrictions from spatter or caused by crimping or kinking of the MIG gun cable, are compensated for without the welder having to interact with the system. The GSS surge flow restrictor size allows the welder to control rate within usable limits. However if they are setting excessively high flow rates (we have measured flows at the gun nozzle of 150 CFH when the needle valve is opened wide) the GSS will limit the flow to the level set by the peak flow orifice. By maintaining the original delivery pressure, a controlled amount of extra gas flow is quickly available at the weld start to displace any air which diffuses into the torch nozzle and hose when welding is stopped. It also quickly provides extra gas to purge air from the weld start zone at a flow rate that is not excessive causing air to be aspirated into the gas shield. At typical shielding gas flow rates and for most gas delivery hose lengths the small pressure drop in the GSS hose is easily handled. 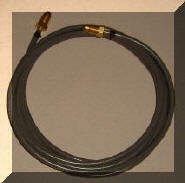 With most gas delivery pipeline pressures and regulator/ the GSS can be used with hose lengths up to 75 to 100 feet. However for lengths above 50 feet we recommend you contact us and define the pipeline pressure you are using or if on cylinder supply the regulator model being employed. WANT TO LOCK-IN FLOW SETTINGS? If it is desired to lock the flow setting to prevent welders from increasing set flow rates we have another patented product that allows locking most brands and models of flowmeters, both pipeline and cylinders types. Made from billet aluminum it slips over the flow control knob after the maximum flow if set. A set screw locks it to the knob, no alteration of the flowmeter is needed. The knob can not be turned further in the direction of increased flow. An optional small brass padlock prevents access to the set screw.